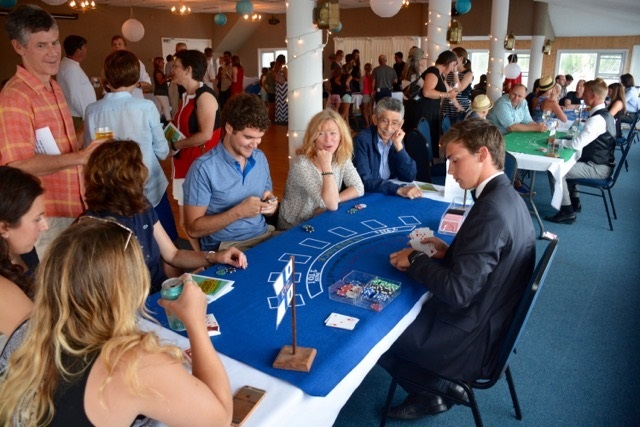 Junior Sailing Casino Night was a huge success! The JS staff wanted to thank all the members who supported their Casino Fundraiser last evening either by sponsorship or showing up and participating in the festivities! It was a great success! and the entire TEAM did a great Job in creating a very successful event at KYC! Special thanks goes out to Grace and Elizabeth who made all the magic happen! We hope all enjoyed themselves last evening, and hopefully you didn't have to "bet your shirt" to pay off your debt at the table! We are still adding up the pennies, and will let everyone know the final outcome of funds raised shortly! Thanks again to the bar, kitchen and especially JS Team for a fun filled evening!! This weekend is the Partridge Bowl, KYC's annual race to the club property, Jemmet's Landing. The winner gets to take the first sip from the Partidge Bowl. This year, we will be having a “Special Chef” making the trip and preparing a delicious feast on the grill featuring a choice of local steaks or grilled chicken. Dinner tickets will be $25 per person. For the kids there will be burgers and veggies for $15 per child. 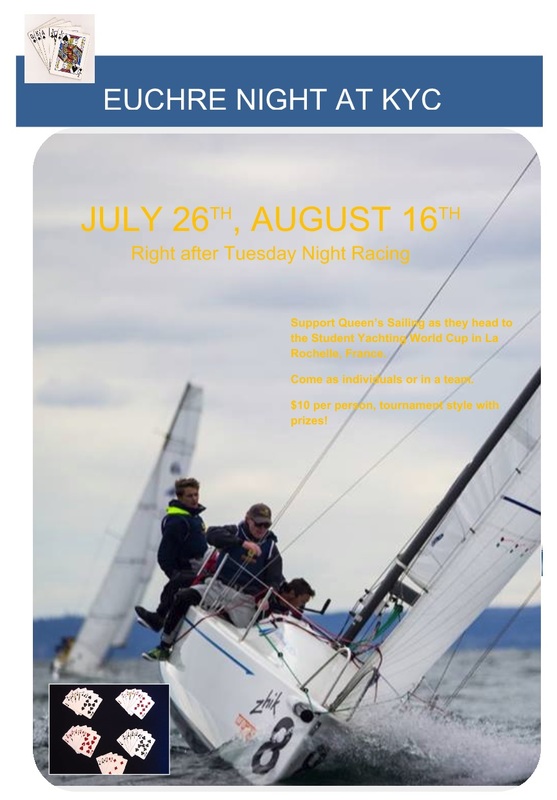 Please reserve your dinner tickets with Greg at manager@kingstonyachtclub.ca or please feel free to give the Club a call 613-548-3052. Kingston Young Professionals (KYP) is a collaborative network through the Kingston Chamber of Commerce that strives to build a community of young professionals (19-39), and employers. KYP initiatives are founded on three pillars: skill building, networking, and advocacy. One of the founding members was our very own Matt Fair. This young and energetic organization will be having their summer social mixer at KYC on Thursday, July 28th (6-9pm). If you are interested in seeing what they are all about, please stop by! There’s lots to do in the Picton area – so it’s not just about the jazz. We will hold our traditional BYO dinner on Saturday night above Books & Company and Miss Lily’s Café. Our Regent Theatre tickets are $40 each and the pre-show dinner is expected to be about $30 all in! (more on the dinner later). You are welcome to participate in one or both events. If you need overnight accommodation, check the Picton Harbour Inn – and be close by to join the cruisers for happy hour! Jazz concert tickets for August 20th can be reserved right now at $40 each, by contacting the office at KYC manager@kingstonyachtclub.ca. John Kitney will be arranging dockage for those that are interested, along with the dinner arrangements on Saturday night. We are also looking into a special Friday night option with a Festival Players dinner-theatre production at Rosehall Run winery for “A Splinter in the Heart” (light dinner, show ticket and return taxi transport to Picton Harbour, all-in for $60 each). For show information visit www.festivalplayers.ca Phone (613-548-3052) or email manager@kingstonyachtclub.ca to secure your Jazz tickets on a “first-to-call” basis and please copy (cc) your message to kitneyj@kingston.net for contact about other weekend events. Your $40 jazz show tickets will be charged to your KYC account. We will be organizing a HIP SHOW at KYC on Aug 20th! Please come out and be part of their final Show! More details will follow in the upcoming newsletter as well as in the Clubhouse! 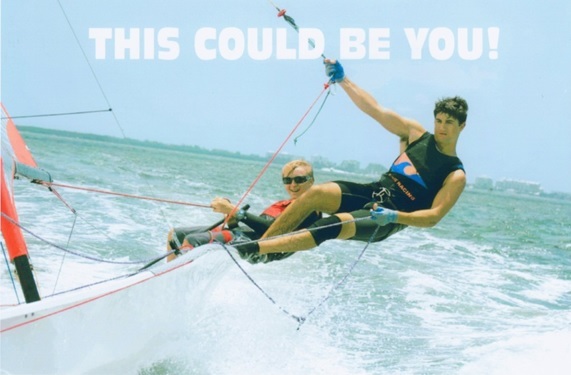 Sign up at the Junior Sailing School. Racing will be every week beginning Monday July 4th! No racing will take place Monday August 1st, 2016. Once again we would like to congratulate John Lowther & Paul Switzer, for placing first and second respectively in the Hudson, Quebec Regatta which took place this past weekend! Keep it up Gents, and we may have to build a new floor for all of your trophies!! It is with great pleasure to report to members of KYC and KPS that the partnership between the two boating organizations has been a great success! This arrangement has allowed KPS members to learn more about KYC and for KYC members to benefit from CPS-ECP educational and safety awareness programs. During the past two years more than two hundred boaters have participated and enjoyed our partnership arrangements. We would like to thank both the KYC and KPS members for their support and consideration in promoting this partnership. We look forward to a long and sustaining relationship one that benefits both organizations. Last chance to sign up for your Race Committee duty (if you haven't signed up for 2 already) before they are assigned for you. Our extended cruise around the County departs Monday 25 July for 8 days. This new cruise will also include our annual Waupoos Rendezvous, 30 July to 01 August. Please consider joining us for the full week - or arrive in Waupoos on our own on Saturday 30 July for a fun weekend down in the County. Request your RSVP via e-mail to: petere.fedora@gmail.com We ask for number of crew, boat name, type, length, beam and draft. We now have in stock new burgees for all Cruisers, including our Basic, 5 year and new 10 year burgees. Please contact petere.fedora@gmail.com should you wish to obtain one - or replace your current Cruising Fleet burgee. We would like to welcome the following new members to KYC! Our KYC Community has now grown to over 70 new members this year (with 10 being part of the race team). Our Membership has done a fantastic job this year in both bringing guests to the Club and showing them what we have to offer as well as proposing new members! I encourage everyone to still help us out in spreading the Word about our "Cottage in the City." Wouldn't it be fantastic if we are able to reach 100 new members in one season! Again, thank you to everyone who has assisted in spreading the word about our fantastic Club! Welcome all to the club!